The Women’s Center has a remarkable past, an evolving present and a promising future. 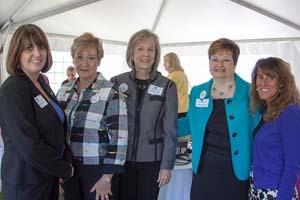 On May 7, nearly 140 people started their day at the 11th annual Women’s Leadership Breakfast “Celebrating 20 Years of The Women’s Center at TCC” on the quad of the Portsmouth Campus. The morning began with Tidewater Community College President Edna Baehre-Kolovani, who reminded attendees that the Women’s Center started as a single office on the original Portsmouth Campus in Suffolk. She marveled at the expanding programs and services for women that are ready to take another step forward. Baehre-Kolovani announced that the benchmark programs of the Women’s Center,International Programs,International Student Services, study abroad and other academic initiatives will be brought together under an umbrella program titled the Office of Intercultural Learning. Jeanne Natali, interim coordinator of the Women’s Center and director of International Programs, emphasized the Women’s Center’s future as a significant component of the Office of Intercultural Learning. “Looking forward to the next 20 years, the Women’s Center will continue to offer comprehensive specialized services to educate, empower, enhance and engage women so they can define, pursue and achieve their goals and it will increasingly focus on leadership in a global community,” she said. In 2012-13, the Women’s Center served 1,642 students, and 1,386 students participated in one of several educational programs. Eight students completed the Women Inspiring Self-Empowerment (WISE)leadership development program and are set to travel at no cost to the National Conference of College Women Student Leaders at the University of Maryland later this month. A longtime supporter of the Women’s Center, Carol Curtis, the guest speaker at the breakfast, talked about her professional journey, which started at TCC more than 30 years ago as a student. Today Curtis is president of Noah Enterprises, a $20 million general contracting business. Curtis has worked with the Women’s Center as a mentor and recently with TCC’s Office of Development to create a match donation program for the Women’s Center. Following Curtis’ address, N.E.W.S. 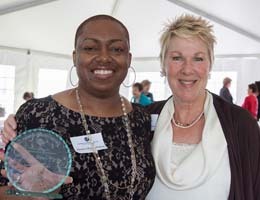 member Amy Spangler announced the 2013 Mary Pat Liggio Student Leadership Award winner, Monica Harps-Wilson. This award, named for the founding coordinator of the Women’s Center, recognizes an academically successful student who has demonstrated leadership on campus and in the community. Laura Soulsby, educational programming and communications coordinator for the Women’s Center, presented the inaugural Dr. Alexsandria Manrov STEM Awards to students Kristine Adriano and Kathleen Copeland-Fish. Named after the former TCC biology professor, the award, made possible by a gift bestowed to the Women’s Center, recognizes the academic achievements of women pursuing careers in science, technology, engineering or mathematics. Adriano graduated in May with an associate of science in engineering with plans to pursue mechanical engineering at Virginia Tech this fall. Copeland-Fish, who also graduated from TCC in May, will transfer to George Mason University to pursue her bachelor’s in environmental science. Following the awards, Soulsby went off the program to invite Catherine Wass, N.E.W.S. chair, to the stage. On behalf of N.E.W.S. and the Women’s Center, Wass surprised former N.E.W.S. chair Peggy Layne with an art piece (created by Ed Francis, an instructor at the Visual Arts Center) to thank her for her many years of service to the Women’s Center. Layne, recently appointed to TCC’s Educational Foundation Board, is stepping down from N.E.W.S. Layne closed the program stressing the need for support in order for the Women’s Center to be at the forefront of women’s leadership. She explained that financial support and volunteering time and energy can make a significant impact on the lives of TCC students just like Monica Harps-Wilson. Layne concluded by thanking attendees and event sponsors, including U.S. Trust, Financial Designs of Virginia, Optima Family Care, N.E.W.S. members, and ambassadors.